Freelance SEO Consultant How Much Money Will You Make From Link Building? If you know the value of link building and the work involved – then you probably don’t ask this question out loud. Maybe because it sounds silly, or you feel like you may offend someone! But, I can sympathise with the fact that you’re a business owner and will have had this thought at some point. And then you probably tried to figure out how much you can pay per link, and if the revenue generated per link is a lot higher – then you know you’re onto a winner. Problem is – knowing exactly what revenue link building will get you, is not something you can really know, before you’ve even started properly building links (and I mean, white hat links) and tracking your sales. And once you’ve done that, consider that links are not a straightforward fixed price commodity– i.e. not all links are created equally. It’s quite possible to have 1 link which is worth more traffic/sales than the previous ten combined. “Link juice” effect – how does the authority of the link affect rankings? SEO impact of that link on nearby pages – can you accurately measure that? Direct referral traffic from the link? What about spam signals – can you ascertain which links are causing a reduction? Will the authority of that permanent link increase over time? – thereby eventually giving you more traffic than you’d expect. The quality of the content on the site– could this be affecting how many sales you’re making? You also want to bear in mind this very key point which happens between getting the traffic and making sales– how well are you converting the traffic? My expertise is not conversion rate optimisation, but it something you definitely cannot skip over, if you want to best capitalise on your traffic. Is there enough engaging content on the site which suits your ideal audience? That is why there will never reach a stage where you have “enough” content. Keep on creating good quality content in order to keep people on the site as long as possible. Are your headlines and CTAs above the fold? Are you using too much industry jargon? You may need to simplify the content for your audience. Do you stand out from your competitors? Whether that’s by making it more personal, telling your story, or updating your “About Us” page to seem more human. Do you need to raise your prices? Did you try to Split test your headlines? Have you incorporated trust symbols like membership associations or accreditation badges? Keeping load time as fast as possible? It is a never ending process and you never really will reach your full potential on conversion (I’m always testing things on my own site). And what works for one person – may not work for you. Link Building Doesn’t Just Build Links! Yep, sound weird but sometimes just getting a link isn’t all there is to it. There are so many intangibles to consider even aside from link building, which is why any reputable link builder or agency worth their salt, will not charge per link. Honestly – a lot of emails will either get ignored or they’ll refuse to link. Getting featured on a print magazine or whitepaper. Getting a lucrative spot on the next email or subscription only newsletter. They may offer to share your content on social media. They may become a “real world” connection and other networking opportunities may open up down the road. All of these have happened in some form to my previous clients and it would have been hard to package intangible things like these up. I wasn’t just producing a list of links – I was providing a service. So going back to link building – you can’t really track the effect of a single link on your revenue… unless you want to spend the next year calculating it and driving yourself mad! What you’re better doing is calculating your average customer lifetime value – and knowing your own business numbers. I.e. how many of your customers/enquiries turn into a sale, how many of those are recurring, referrals, etc. 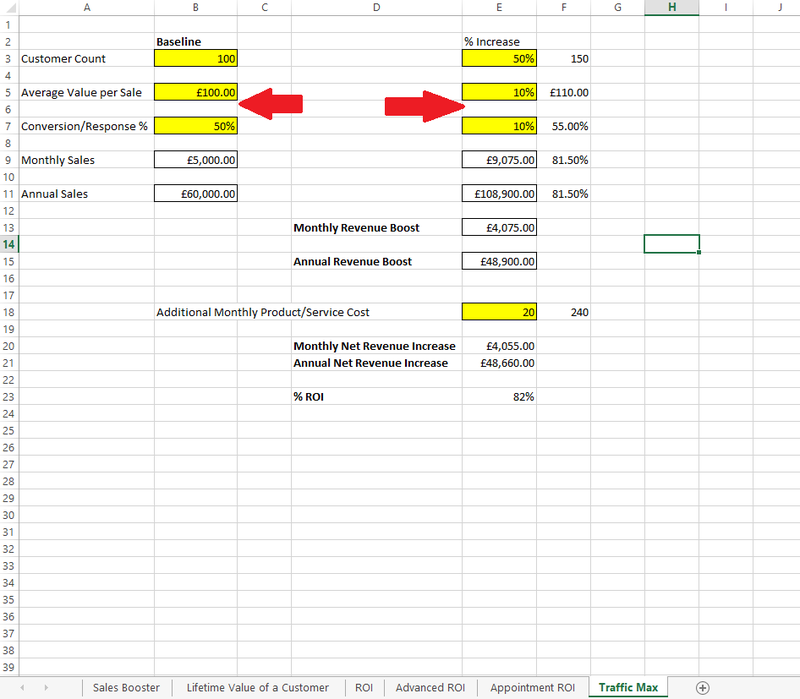 Just fill in the yellow boxes with the numbers your business generates and it will calculate the rest for you. It will give you a good estimate of how your numbers would look if you had a certain percentage increase. E.g. if your traffic went up 200%, (as long as its relevant traffic) you should then experience a 200% increase in the number of customers/sales.